Give the gift you know they will love, A Gift Card from Jersey Mike’s! 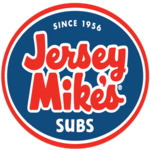 Jersey Mike’s fans crave their subs made Mike’s Way® with the freshest vegetables – onions, lettuce and tomatoes – topped off with an exquisite zing of “the juice” – red wine vinegar and olive oil blended to perfection. Jersey Mike’s premium meats and cheeses are sliced on the spot, piled high on in-store baked bread and served up with a helping of neighborly banter from a dedicated and high-energy team.